Airing My Laundry, One Post At A Time...: Deal Alert: SAVE On Huggies At Sam's Club And With Ibotta! 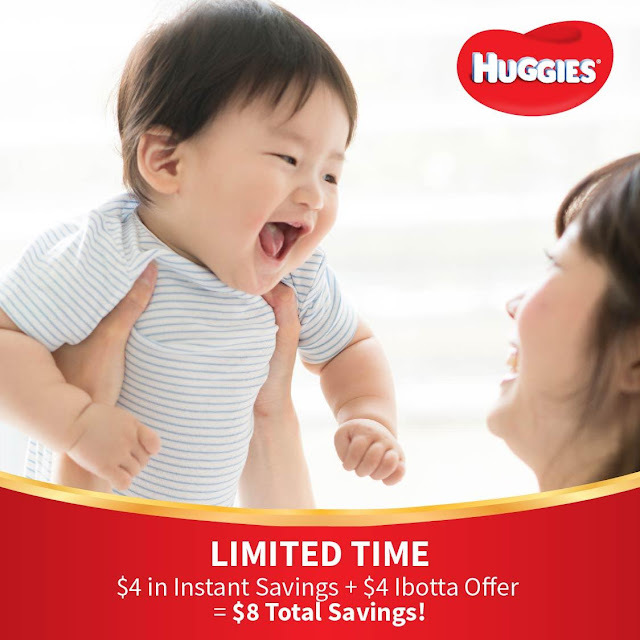 Deal Alert: SAVE On Huggies At Sam's Club And With Ibotta! Huggies and Sam’s Club want to make things easier. Right now, when Sam’s Club members purchase any qualifying Huggies product at Sam’s Club, you can get $4 in Instant Savings. And as a bonus, you can use the Ibotta offer on this site for an additional $4 dollars off. That’s $8 in TOTAL SAVINGS, so you and your family can make the most of this season while still getting the Huggies items you depend on daily. I always bought my diapers in bulk when my kids were little. Huggies were always great and I was always very happy with them. My daughter-in-law just had a baby and we need to stock up on diapers! I visit Sam's Club just about once a week, so I'll check this out today. We had 3 in diapers at the same time so we watched for deals like these. $8 is like getting a pack of diapers for free. I should tell my sister!!! She is due for baby 2 in a few weeks!!!! We always bought diapers at Sam's Club. It's nearby, and you can always get the best deals. My sister-in-law has two in diapers right now so she could definitely use something like this. Sam's Club is a wonderful place to save money anyway. Might grab some just to have on hand for baby gifts when the time comes. Always like a good deal. Who doesn't enjoy saving money. I am always using Ibotta though it can be glitschy at times! This is such a great deal. Thanks for the heads up. My cousin just gave birth so Ill share this with her! We always buy diapers in bulk. You can really never have too many diapers on hand! Not a pro-shopper myself. But I do believe that buying in bulk is always cheaper than buying in pieces. And in times where I only need to buy one of a certain product, I look for other people who wants to buy that same product. Then join or organize a "group buy" thing and ask for discounts. I haven't had to buy diapers in a while. I know they were expensive back then and that saving money on them was always a welcome thing. This is a great deal. I love to shop at Sams Club. It is a great place to stock up on all of your essentials. We sadly don't have a Sam's Club near us, and both my kids are still in diapers (the oldest just at night though). What a great way to save a little extra money! I love the Ibotta app, I have saved so much money with it this year! I will have to share this deal with all my mommy friends!! This is such a great deal and it will help save up for Christmas and Holiday season. My niece personally use Huggies. I always go to Sam's Club for our diapers. They always have the best deals. Thanks for letting me know about the Huggies deal. Great deal on diapers! I remember the days of buying diapers, and you end up spending so much money. So important to save when you can find a deal. $8 off! That’s amazing! Wish we were Sam’s club members! My husband and I were just discussing purchasing diapers! Ibotta is the best thing ever. I will make sure I tell my parent friends who need them! what a great offer. My kid is 15 now but I remember how much we spent on diapers. sounds like a valuable Club to be a part of. This is a great deal, I have a one year old and Huggies is the only brand we use. I gotta get to Sam's CLub tomorrow. My kids always used Huggies diapers and it's incredible how much you spend on diapers. This is a great deal! I used to use Huggies for my son, they were great and we loved them! When buying baby products, you would want to buy items that are not only safe and comfortable for the babies but affordable as well. It's better to know the product and maybe bulk in bulks since they use it up fast. This sounds like some amazing deals! I remembered using this brand when my kid was little. I'm going to pass this along to my friends. Saving on diapers can be such a help! This is an amazing deal that they have going on. We are always looking for some good deals on diapers. This a really big saving! I love the Ibotta app! My kids are out of the diaper age, but this is a great deal! Awesome deal! Always on the lookout for diaper deals. I love to use Ibotta and visit Sams Club. I agree, it is not only expensive to parents but to everyone. I guess every discount is worthwhile. Lots of parents will save with the $4.00 discount. Such a great savings for parents with kiddos still in diapers. Those things definitely seem like they just keep getting more expensive!